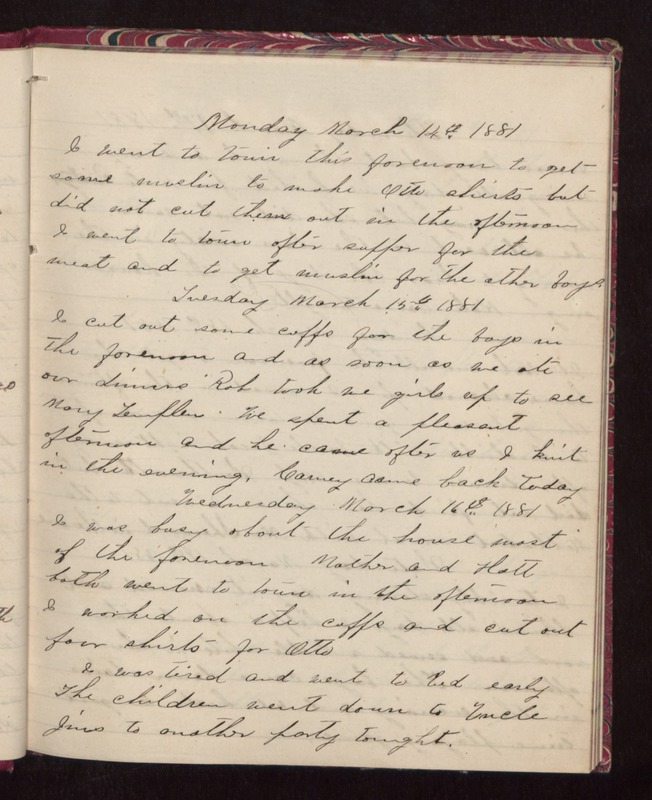 Monday March 14th 1881 I went to town this forenoon to get some muslin to make Otto shirts but did not cut them out in the afternoon I went to town after supper for the meat and to get muslin for the other boys. Tuesday March 15th 1881 I cut some cuffs for the boys in the forenoon and as soon as we ate our dinner Rob took we girls up to see Mary Templin. We spent a pleasant afternoon and he came after us I knit in the evening. Carney came back today Wednesday March 16th 1881 I was busy about the house most of the forenoon Mother and Hatt both went to town in the afternoon I worked on the cuffs and cut out four shirts for Otto I was tired and went to bed early The children went down to Uncle Jims to another party tonight.